There are two neutral Benzopyridines: quinoline (benzo[b]pyridine) and isoquinoline (benzo[c]pyridine), altogether by the quinolizinium cation (benzo[a]pyridinium) (figure illustrated below), made up by a ring fusion that employs the nitrogen atom. Quinolines and isoquinolines are very significant as their derivatives, a large proportion of which are alkaloids, illustrate helpful biological effects. Certainly, the medicinal properties of the plants that biosynthesize such alkaloids have been acknowledged for centuries, long before the nature of the compounds responsible was known. The two such natural products are the anti-malarial agent quinine, from the bark of Cinchona trees, and morphine, a tetrahydroisoquinoline derivative, found in the latex from poppy seed capsules. Morphine and its di-0-acetyl derivative, heroin are still employed to control severe pain, in spite of being addictive drugs. Quinoline is a base since, as for pyridine. The lone pair of electrons on the nitrogen atom is not used in its internal resonance. However it is an aromatic compound, the valence bond illustration of quinoline exhibits two of the neutral contributors, A and C (figure illustrated below) to the resonance hybrid as quinonoid in character, while in B either the carbo-cycle or the heterocycle should exist in the form of a 1,3-diene. The presence of the pyridine nucleus is reflected via the inclusion of doubly charged canonical forms. Though, the representations F to H comprise disruption of both monocyclic π systems concurrently. This follows that these are of higher energy, and they contribute very much less to the overall explanation of the molecule as compare to do the alternatives D and E which influence only the pyridine system. The bond lengths of quinoline, that are irregular, support the resonance explanation; therefore, the 1,2-, 5,6- and 7,8-linkages are shorter as compare to that of the carbon-carbon bond in benzene (more double bond character!). There is as well a dipole of 2.19 D directed towards the nitrogen atom. Acids and Lewis acids react by quinoline at the fundamental nitrogen atom to form quinolinium salts, and there is a question over the nature of the substrate for the electrophilic attack, that is, is it quinoline or the quinolinium cation? The answer is not a simple one and appears to base on the reagents and reaction conditions. 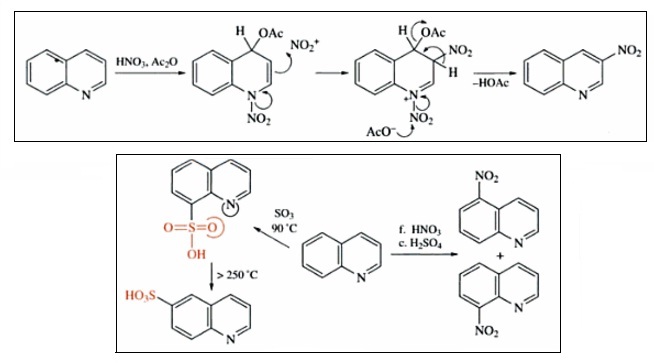 Therefore, while acetyl nitrate at 20 oC gives mostly 3-nitroquinoline (figure shown below), fuming nitric acid in concentrated sulphuric acid having sulphur trioxide at 15 to 20 °C yields a mixture of 5-nitroquinoline (35%) and 8-nitroquinoline (43%) (figure shown below). In case of acetyl nitrate, the reaction might carry on by the 1.4-addition of the reagent to quinoline, followed via electrophilic attack on the 1,4-dihydro derivative. Though, the rate of nitration of quinoline in 80 to 99% sulphuric acid is of the similar order as that of N-methylquinolinium salts, suggesting that here the quinolinium cation might be the target for attack. Sulphonation with oleum at 90 °C affords mostly the 8-sulphonic acid, however as this product is sterically hindered, at higher temperatures it rearranges to the 6-sulphonic acid (figure shown below). 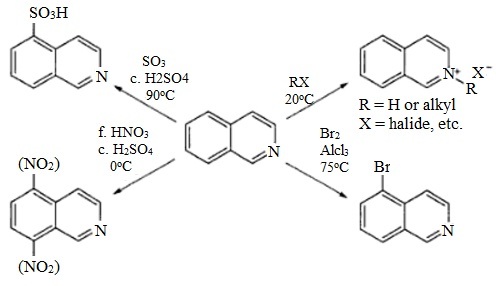 This rearrangement is identical to that shown by naphthalene-l-sulphonic acid, the kinetic sulphonation product of naphthalene that isomerizes on heating to the thermodynamically favored (less hindered) 2-isomer. Alkyl and acyl halides react directly by quinoline to provide N-alkyl or N-acylquinolinium salts (figure shown below). While the N-alkyl salts are stable and can frequently be isolated as crystalline solids, the N-acyl analogues are unstable and experience rapid hydrolysis in moist air or in the aqueous solution. N-Acyl- or N-sulphonylquinolinium salts can be trapped via cyanide ion to form what are known usually as Reissert adducts. The simple elimination of the N-substituent in a subsequent reaction by a base gives access to 2-cyanoquinoline (figure below). There is a strong similarity among the reactions of pyridines and quino-lines towards nucleophiles. Addition takes place mostly at C-2, giving 1,2-dihydroquinolines, however the locus of the reaction can be diverted to C-4, specifically if there is a good leaving group placed at this position. In a Chichibabin-kind reaction, quinoline reacts by potassamide (KNH2) in liquid ammonia at 70 °C to provide 2-amino-1,2-dihydroquinoline and this is oxidized via potassium permanganate imanganate(VI)I at similar temperature to result 2-aminoquinoline. 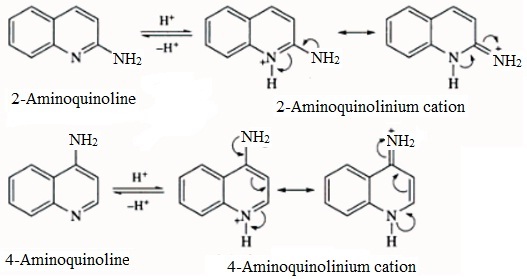 If the temperature is allowed to rise to 45 °C the adduct rearranges to 4-amino-1.4-dihydroquinoline and on oxidation this product provides 4-aminoquinoline. The most general approach is the Skraup synthesis. Here a mixture of glycerol (propane-1,2,3-triol), aniline (phenylamine), sulphuric acid. Nitrobenzene and ferrous [iron(II) sulphate] are heated altogether (figure below). The last reagent is added as a moderator to prevent 'runaway' reaction; nitrobenzene, or an alternative oxidant (that is, iodine or chloroanil are often recommended), is needed to transform the product, 1,2-dihydroquinoline to quinoline. The Skraup method is applicable to quinoline derivatives substituted in the benzene ring, providing such substituents are not strongly electron withdrawing. 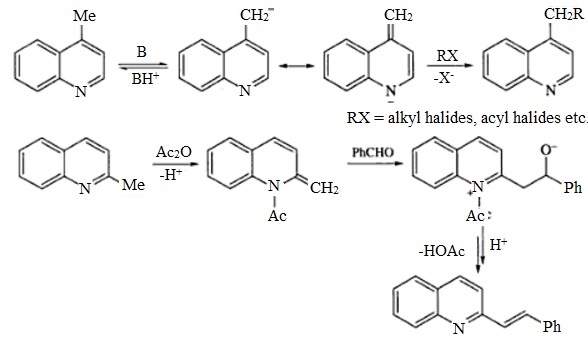 The other approach, the Friedlander synthesis, is to condense a 2-aminophenyl ketone by an aldehyde or ketone which includes a methylene unit (that is, to permit enolization and subsequent (aromatization), in contact by either and acid or base as the catalyst (figure shown below). Similar to the corresponding methylpyridines, 2- and 4-methylquinolines can be deprotonated by a base, like sodium methoxide, forming resonance-stabilized anions. 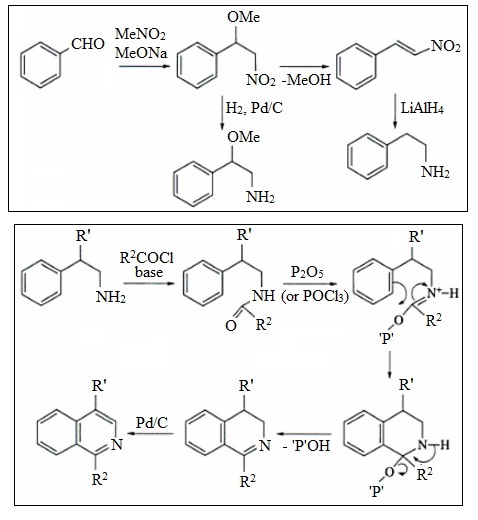 The latter are helpful in synthesis, giving nucleophilic reagents that let extension of quinoline side chains via reactions with proper electrophiles. Activation of the 2-methyl group can as well be accomplished by the utilization of acetic anhydride (the similar kind of process takes place by 2-methylpyridine). Such compounds exist as the amino tautomers and generally the imino forms are not noticed. All react by acids at heterocyclic nitrogen atom, giving salts. 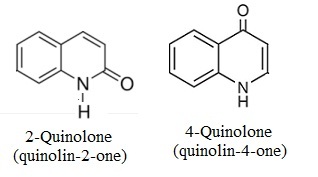 The protonated forms of both 2- and 4-aminoquino-lines are resonance hybrids, however 4-aminoquinoline is more basic than 2-aminoquinoline, possibly due to the nitrogen atoms that carry the charge between them in the corresponding cation are more broadly separated. However, hydroxyquinolines in which the hydroxy substituent is present in the benzene ring are known and exhibit phenolic activity, 2- and 4-hydroxyquinoline exist solely as the quinolone tautomers. Quinolones are acquired in the Conrad-Limpach-Knorr synthesis that is subject to either kinetic or thermodynamic control, whenever aniline is reacted by a 3-keto ester. At room temperature the more reactive keto group joins by the aniline nitrogen atom, leading to an enamino ester: the kinetic product. Cyclization of this product to a 4-quinolone needs heating at around 250 oC. On the other hand, whenever the reaction is taken out at 140oC, the thermodynamically preferred amido ketone is made (fig (b)), even although the less reactive ester group of the keto ester is the locus of the initial nucleophilic attack. Ring closure of the amino ketone then affords the 4-quinolone. The valence bond explanation of isoquinoline is identical to that of quinoline. Only A, B, C and D are of main significance in explaining the molecule, as the contributors E, F, G and H comprise a disruption of the π-systems of both rings. Isoquinoline, such as quinoline, is protonated and alkylated at the nitrogen atom, however electrophilic substitution in the benzene ring is as well simply accomplished. Sulphonation by oleum gives mostly the 5-sulphonic acid, however fuming nitric acid and concentrated sulphuric acid at 0°C generate a 1:1 mixture of 5- and 8-nitroisoquinolines. Bromination in the presence of aluminium trichloride at 75 °C provides a 78% yield of 5-bromoisoquinoline. Nucleophilic addition occurs at C-1 and this is considerably improved if the reaction is taken out on an isoquinolinium salt. Reduction by lithium aluminium hydride [tetrallydroaluminate(III)] in THE (tetrahydrofuran), for illustration, provides a 1.2-dihydroisoquinoline. Such products behave as cyclic enamines and if isoquinolinium salts are reacted by sodium borohydridc [tetrahy-droboronate(III)] in aqueous ethanol, further reduction to 1,2,3,4- tetrahydroisoquinolines is effected via protonation at C-4 and then hydride transfer from the reagent to C-3. The cyanide anion adds to C-1 in 2-benzoylisoquinolinium salts in water/DCM (dichloromethane), making Reissert compounds; then, just similar to their quinoline counterparts. 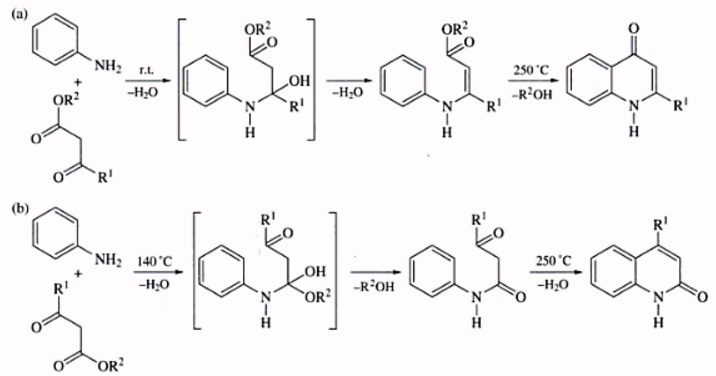 The adducts can be deprotonated via a base by the loss of the N-substituent and the formation of a 1-cyanoisoquinoline. The biological properties of numerous derivatives have made sure the growth of a number of syntheses providing access to all kinds of isoquinolines, both natural and man-made. Three significant routes are the Bischler-Napieralski, Pictet-Spengler and Pomeranz-Fritsch methods. 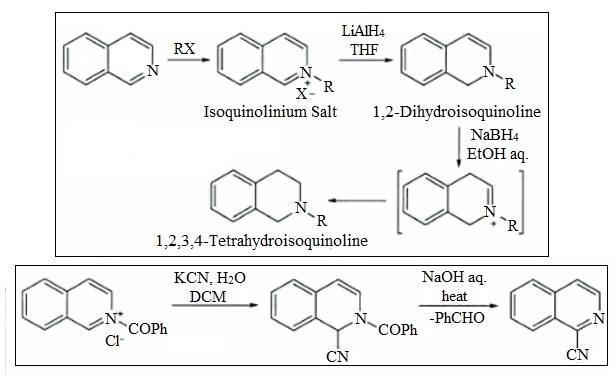 This process is very helpful for the construction of 1-substituted 3,4- dihydroisoquinolines, which if essential can be oxidized to isoquinolines. The 11-phenylethylamine (1-amino-2-phenylethane) is the starting material, and this is generally functioned by reacting an aromatic aldehyde by nitromethane in the presence of sodium methoxide and allowing the adduct to remove methanol and provide a (3-nitrostyrene (1-nitro-2-phenylethene). This product is then reduced to the 11-phenylethylamine, generally by the action of lithium aluminium hydride. Once made, the β-phenylethylamine is reacted by an acyl chloride and a base to provide the corresponding amide (R' = ID and then this is cyclized to a 3,4-dihydro-isoquinoline by treatment by either phosphorus pentoxide or phosphorus oxychloride. Lastly, aromatization is achieved by heating the 3,4-dihydroisoquinoline over the palladium on charcoal. On the other hand, a β-methoxy-β-phenylethylamine can be employed to circumvent the oxidation step after the conventional Bischler-Naperialski cyclization. Here, whenever treated by the phosphorus reagent the amide (R' = OMe) experiences both cyclization and the removal of methanol to provide the isoquinoline (R = H) directly. This is termed as the Pictet-Gams modification of the Bischler-Napieralski synthesis. The mechanistically alike Pictet-Spengler synthesis is as well much employed for the preparation of 1,2,3,4-tetrahydroisoquinolines, starting from a β-phenylethylamine and an aldehyde. The reaction inter-mediate is the imine that, given the benzene ring contains electron-donating groups, often ring closes under extreme mild conditions. Certainly, cyclization can take place under physiological conditions and in nature this is a significant stop in the biosynthesis of numerous tetrahydroisoquinoline alkaloids. As both the prior two routes depend on a cyclization of the benzene ring to what becomes C-1 of the heterocycle, the key step in the Pomeranz-Fritch synthesis is the formation of a bond to C-4. 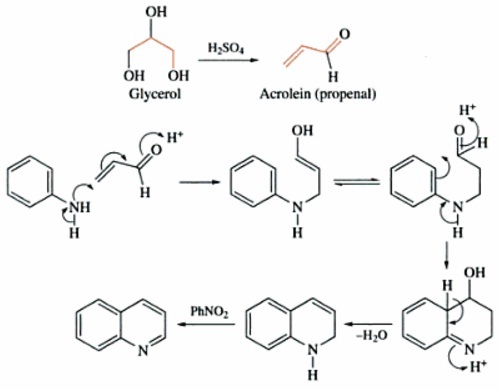 Benzaldehyde is the starting material and it is reacted by an amino-acetaldehyde dialkyl acetal to form an imine that is then cyclized directly under relatively severe acidic conditions (example: concentrated H2SO4, at 100 °C) to provide the isoquinoline. However the Pomeranz-Fritsch ring-closure conditions allow the cyclization of unsubstituted imines, the reaction is accelerated greatly whenever electron-donating groups are present in the benzene ring. However a slight modification the Pomeranz-Fritsch synthesis can be made specifically helpful for the preparation of 1,2-dihydroisoquinolines. The imine is first reduced by sodium borohydride in 98% ethanol to the corresponding benzylamine, prior to cyclization by treatment by 6 M hydrochloric acid. If electron-donating groups (like methoxyl) are present in the aromatic unit of the benzylamine, the ring-closure step takes place at room temperature to provide a 1, 2-dihydroisoquino-line. As 1,2-dihydroisoquinolines are unstable in air it is usual to take out the reaction under an atmosphere of oxygen-free nitrogen. The benefit of the modified Pomeranz-Fritsch synthesis is that the 1,2-dihydroisoquinolines can be reacted in situ with electrophiles yielding 1,4-dihydroisoquinolinium salts which react with nucleophiles at C-3. Such a 'single pot' method can be employed to manufacture complex 1,2,3,4 tetrahydroisoquinolines.